UPDATED 2:41 PM With Explanation. I was going to post this yesterday but Chris Nguyen kind of stole the show with this post. This will be the first post in a series of predictions on all races that involve any part of Orange County. We will start with a look at the 38th Congressional District which covers just a tiny piece of Orange County (La Palma). Thank you to the people at Meridian Pacific for posting these great maps on their website. As a matter of fact Chris Nguyen wrote a post that states the California Redistricting Commission forgot that La Palma was part of Orange County. This seat is a stronghold for Democrats who have over a 20 point advantage in registration. Looking at the numbers from 2010, no Republican for any major office ended up winning in this district. The only victory here that was not supported by the Democratic Party would be Proposition 8 passing by around 20 points. Currently Congresswoman Linda Sanchez holds this seat and has been representing this area for a while. Challengers include Benjamin Campos a Certified Public Accountant that has a business based in Long Beach. He is listed as a Republican on the ballot. The other challenger is Jorge Robles a Law Enforcement Officer that appears to have a business based in Montebello. He is also listed as a Republican on the ballot. The factors at play- I have gotten a couple of e-mails asking me to further explain what factors are at play that made me arrive at my prediction. I assure you that this is not a crystal ball or a flip of a coin. Linda Sanchez is the only Democrat on the ballot in what is a very liberal seat. She also has incumbency on her side. She will advance based on these factors alone not to mention relatively high name ID. The other two candidates are both Republicans and they will both pull from the same base of voters. However, I believe that voters are more likely to support someone who is involved in law enforcement as opposed to a CPA. 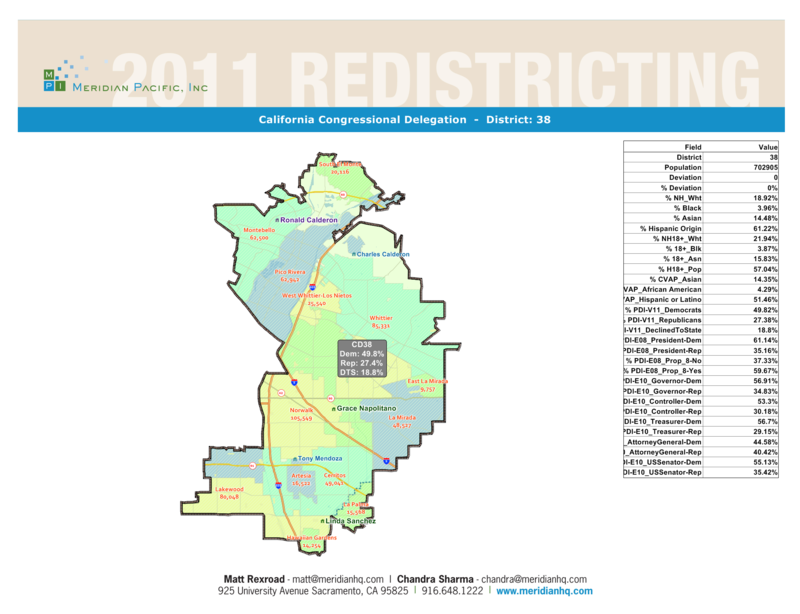 This entry was posted on April 10, 2012 at 11:18 AM	and is filed under 38th Congressional District. Tagged: Benjamin Campos, Jorge Robles, Linda Sanchez. You can follow any responses to this entry through the RSS 2.0 feed. You can leave a response, or trackback from your own site.